Brook Lee signs a copy of "Universal Beauty" for Craig Tottori at Moku Ola Hawaiian Healing Center in the Koko Marina Shopping Center. Last week was a blur to Brook Lee, back in town briefly to promote the book to which she contributed, "Universal Beauty: The Miss Universe Guide to Beauty," as well as to promote ImaginAsian TV, a new network geared toward all things Asian. As the network's newly minted director of development, Lee is charged with bringing original programming to the 24/7 network. "Universal Beauty: The Miss Universe Guide to Beauty"
With foreward by Donald Trump and advice from Miss Universe title holders, including Hawaii's Brook Lee; hardcover, $29.95. Available at Borders locations. "We've been on the air in Hawaii since January, but we hadn't had a chance to do a big launch," she said. That opportunity presented itself at Sunset on the Beach Saturday night, with Lee as host to those who had come to watch "Harry Potter and the Goblet of Fire," along with snippets of iaTV programing, including an interview with one of "Harry Potter's" young stars, Katie Leung. While here, Lee met with producers in hope that some home-grown talent will find its way onto the national airwaves. She said it's otherwise been a struggle to find programming that fits the network's criteria of all-Asian programming all the time. Currently living and working out of Los Angeles, Lee, the 1997 Miss Universe from Hawaii, said, "By numbers, the Asian-American population is bigger on the mainland, but the culture is not reflected in the media, as opposed to here, where we embrace all things that speak to the Asian-American experience." The main difficulty in finding a Hawaii crossover hit is that "a lot of things here are niche-market driven," Lee said. "There's a lot of pidgin, a lot of inside jokes; people on the mainland don't understand it. We have to find stuff that will stick." The network itself is based out of New York, where a group of Asian-American men started with a movie theater that offered first-run Asian films as an alternative to repetitive Hollywood fare. Its popularity led to rapid expansion into radio and, now, television. Lee's association with iaTV came about as a result of her work for "Pacific Fusion," a TV magazine based out of San Francisco, specializing in Asian and Asian-American issues and culture. In her travels to promote the show, she got to know the iaTV execs, who offered her "a real job," which seems to come somewhat as a relief to a woman accustomed to short-term gigs and living by her famous wit and smarts, which come across in her interviews in "Universal Beauty." 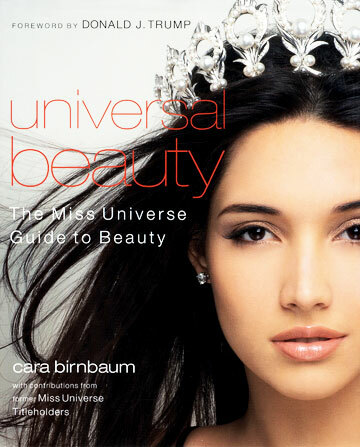 The book of tips from former Miss Universe title holders was written by Cara Birnbaum, with a foreword by pageant owner Donald Trump. You can almost hear the chorus of cynics saying, "Yeah, right," at the idea of a book featuring beauty advice from women fortunate to have been born beautiful. Yet, the world's greatest beauties have the same insecurities as anyone else, also contending with the passage of time and the dry skin, collagen loss and wrinkles that come with it. And it's no secret that Lee never saw herself as particularly beautiful, crediting her win to a mixture of smarts and personality. "I was really flying under the radar the entire time. Before, (Hawaii contestants) were told to go win the congeniality and hair awards. We really were not expected to win. I'd be told, 'Just get the Pantene award, spread the aloha spirit and don't forget to pass out the mac nuts.'" Amelia Vega, Miss Universe 2003, from the Dominican Republic, is on the cover of "Universal Beauty." Brook Lee is on the back cover. To this day she said she wondered, while standing with 10 other former Miss Universes for the New York launch of the book, "How did I win this thing? Because those girls are tall, like 6-foot-1, and so beautiful. I'm only 5-7." "But I'm a realist. My identity lay more with knowing how to communicate. In the book, if you notice, I'm not the one to go to for eye-makeup tips." In the book, with interviews gleaned over eight hours in the course of a year, we learn that low-maintenance Lee doesn't even own a hairbrush. "I just throw it up in a bun and rip it off before going out. I think the cut has a lot to do with it, and I have a great guy who cuts my hair." This is one tip that's not in the book, but she'll go six months or more without a haircut to come home and have Paul Tamaoka of Bottega Antoine cut her hair. "I have angry, tough, coarse hair, so if it's not cut right ..."
The bottom line, she said, is "at the end of the day, you can only be yourself," and that might serve as iaTV's creed as well. "(Asian-Americans have) always been taught to blend in," Lee said. "Now a new generation is growing up, looking not to be so homogenous, and people on the mainland are crazy about Asians. They want to dress like 'harajuku' girls. They want to put anime stuff all over. "It's very different when you have National Geographic telling you about your people, as opposed to putting your own stories and experiences on film. "We're just a startup, so it's not like we can set up Pamela Young for the rest of her life and turn her into an Oprah. It's a slow process. "But if you were looking at BET (Black Entertainment Television) 15 years ago, no one thought that African Americans had money. No one was looking at them as a demographic. Now, when Tom Cruise needs to promote his movie, he goes on BET. It's a force to be reckoned with, a voice for a demographic and a people, and I think ImaginAsian has the potential to do that for Asian Americans." To learn more about ImaginAsian TV, visit iatv.tv. Locally, the network airs on Oceanic Time Warner Cable, digital channel 546.